Just because hydraulic valves tend to be smaller and less expensive than other parts of your hydraulic system doesn’t mean you can skimp on these vital parts. If your valves don’t work properly, your system won’t be able to perform its best, and may even stop working altogether. Fortunately, you can enjoy precise fluid control no matter what the operating parameters of your equipment might be by choosing Parker hydraulic valves in San Pedro CA. In addition to having a sterling reputation for high-quality, well-engineered parts, Parker is also known for innovation. One example is their line of Colorflow valves, which feature color-coded checkpoints on each valve to enable precise adjustments in the field, without the need to measure the valve openings. Another exciting Parker product is their electrohydraulic valves. These components use solenoid valves to interface between electronic signals and hydraulic power components. They are programmed using Parker’s unique software. If you are interested in upgrading your hydraulic valves to Parker hydraulic valves in San Pedro CA, just ask one of our experts for advice about your options. 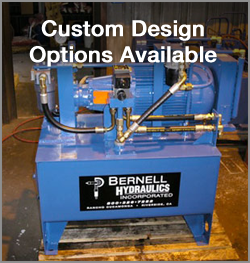 Shopping at Bernell Hydraulics enables you to access Parker’s complete line of valves through a friendly and well-stocked storefront in your local area. If you don’t have time to come in, you can call to order your Parker hydraulic valves in San Pedro CA and we’ll ship or deliver them.